However the go-ahead run scored in this June 1990 game, it scored and Pedro Roa scored it, according to The Bend Bulletin. Put into the game as a pinch-runner for catcher Mike Grahovac in the eighth, Roa came around to score on, of all things, a third-strike wild pitch, The Bulletin wrote. Roa scored on that wild pitch in his third season as a pro. It was also his last season, and one of just 12 appearances he had on the year. Roa's career began in 1988, signed by the Mariners as a free agent out of his native Dominican Republic. Roa started with the Mariners in the rookie Arizona League. He hit .322 in 31 games. He also knocked in 13 and stole three bases. He moved to short-season Bellingham for 1989. In 33 games there, he hit just .157 with 5 RBI and two stolen bases. 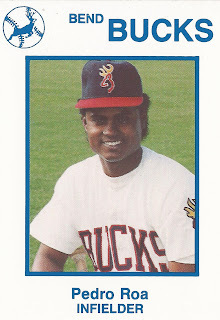 At short-season Bend in 1990, Roa went 1 for 5, with an RBI in another June game, then 1 for 4, with an RBI in a July game. Overall, he hit .156 in 11 appearances to end his career.